In the field of technology, the word disruptive is used for a technology or innovation that brings about a radical change in the way a sector functions by introducing efficiency, affordability and convenience. The technology revolution in the business sector is represented by the extensive use of smarter phones or web conferencing in American offices. However, the impact of disruptive technology on the education sector is much higher. A wave of smart classes and e-learning has transformed the way education is delivered and pursued, today. The presence of technology in classrooms makes the student an active learner instead of a passive one. The education system becomes more student-centric. The student can choose, manipulate and generate what he wants to study and how. The student himself creates the learning environment and the mode of obtaining lessons. E-learning has made the education system more convenient and flexible. The student can learn through his own choice of platform. The role of the teacher also changes as he is no more the sole source of knowledge. He transforms into a mentor and is responsible for providing guidelines and resources to the students. This system increases the self esteem and motivation levels of a student as he becomes an active participator in the whole learning process. It is known that a student learns more by hearing and visualizing than merely reading. The use of activity based audio visuals in the classrooms generates more interest in the lesson being taught. E-learning portals make education available to those students who did not have access to it before. Different courses and methods are being accessed by students of all age groups at their own choice of time and place. It makes the whole education system more dynamic and learner friendly. One of the challenges the system is facing is that its standard testing model is not adaptive to children’s varied speed and ways of learning. Some students respond to the audio visual faster while for others the response time is comparatively slow. However, the challenge can be transformed into an opportunity by the teachers. The teachers can use the traditional ways of teaching for regular teaching. The K-12 e-classroom methods can be brought into use simultaneously, depending on the different learning capacity of the students for example, to improve the performance of the weaker students. The use of technology in classroom encourages creative and out of the box thinking in students, as it presents the monotonous lessons in a very interesting and innovative manner. The process intrigues and stimulates the students. Activity and project based learning is appreciated and encouraged. American Universities were once considered the best in the world but are now striving to catch up on cost effectiveness with their global peers while delivering through the K-12 system. The concept of smart class and elearning is a revolution in itself, making the education system of the country dynamic, efficient, student-centric and flexible. There are certain challenges, which are being dealt with and would soon be overcome with the introduction of newer technology, techniques and processes. The Obama administration announced long-awaited regulations Tuesday to improve labels on hazardous chemicals and make them conform with international guidelines developed by the United Nations. The Occupational Safety and Health Administration estimated that such labels could prevent more than 40 deaths and about 500 workplace injuries and illnesses from exposure to hazardous chemicals each year. Assistant Labor Secretary David Michaels said labels will be easier to understand and less confusing, especially for low-literacy workers. About 43 million U.S. workers come in contact with hazardous materials on the job. The process of developing the rules began during the Bush administration, and the rules were initially proposed more than two years ago. The Obama administration is holding them out as a product of a presidential directive last year to streamline burdensome agency regulations and eliminate red tape. OSHA Training officials said the latest rules would actually save companies more than $475 million annually in training costs and paperwork. Chemical manufacturers currently have to produce two sets of labels and records: one to satisfy U.S. standards and another to meet the U.N. guidelines. "Not only will it save lives and limbs, but it will lead to increased efficiency on part of employers who produce and purchase chemicals," Michaels said. "And it will level the playing field for employers to compete abroad." The rules will be phased in over a transition period and companies will not have to comply with them fully until June 2016. Elizabeth Pullen, president of the American Industrial Hygiene Association, a trade group representing health and safety professionals in the chemical industry, said the new labels will improve protection for workers, employers and chemical users. Marc Freedman, executive director of labor law policy for the U.S. Chamber of Commerce, said businesses generally support the idea of revising label requirements. But he said OSHA went too far by requiring labels to include hazard information about combustible dust - tiny particles that can catch fire as a result of producing chemicals, plastics, metals and foods. "It's going to create a lot of confusion and uncertainty, which will undermine whatever other value this regulation provides to these companies," Freedman said. Michaels said the agency is simply treating combustible dust the same way it has for the last 25 years. He said investigations of deadly explosions, like the sugar dust that blew up the Imperial Sugar plant in Port Wentworth, Ga., in 2008, killing 14, have shown that workers didn't have the safety handling information they needed to prevent accidents. The agency is considering a separate rule that would require many industries to better control combustible dust hazards Health Care Compliance Program. The popular children's chant may have a whole new meaning before long. State and federal government agencies have talked about and passed legislation to move towards digital education. With the rise of tablets on iBook publishing, a new age of learning may be upon us. The American education system, however, must proceed with great caution that this trend does not lead to a new digital divide and greater inequity among students accessing a good education. Let me explain by comparing the paths two nations are taking. South Korea has pledged that all elementary and secondary schools will be completely digital by the year 2015. The ministry of education will ensure that every student has access to a mobile device, a strong connection to the Internet, and a cloud-computing network dedicated to education. In many ways, this isn't a great leap. The Organisation for Economic Co-operation and Development (OECD) listed South Korea—with Internet speeds on average three times faster than that in the United States—as the leading nation on their survey of digital literacy. "Digital technologies provide a great opportunity to make students more active participants in classroom learning," said Barbara Ischinger, OECD Director of Education. "[It helps] to tailor learning ... and to give students access to the world's current research and thinking." What's remarkable is that this ranking, according to the Korean Ministry of Education, is not good enough. The Ministry has since targeted their policies and some $2.4 billion in funding so that best practices in digital learning become the norm for all students within three years. UNESCO has documented through a series of reports how South Korea has equitably integrated digital computing in schools on a national level. Formal standards for teacher education and training, among other best practices, are now being shared widely by the international agency. School systems around the world are watching Korea, not just for its high-achievement rates, but also to see if it succeeds in being the first country to go entirely digital. Last week, computer giant Apple announced the iBook2, a powerful platform for textbooks. It released iBook Author, a free app that allows anyone to publish educational content. Apple also announced that iTunes U, the world's largest repository of educational content, is now available to elementary and secondary schools in 123 countries. Apple's announcement may well be a game changer, but it follows a long line of private tech companies creating tools, sharing content, and offering training to the education industry. There's also political will backing digital learning. In 2010, the U.S. Department of Education unveiled a plan titled "Transforming American Education: Learning Powered by Technology." One of its key goals is wide-scale adoption of digital learning. In 2011, the federal government developed an independent non-profit called Digital Promise, whose mission is "to support a ... research and development program to harness the increasing capacity of advanced information and digital technologies to improve all levels of learning and education ... in order to provide Americans with the knowledge and skills needed to compete in the global economy." States are getting in the game, too. 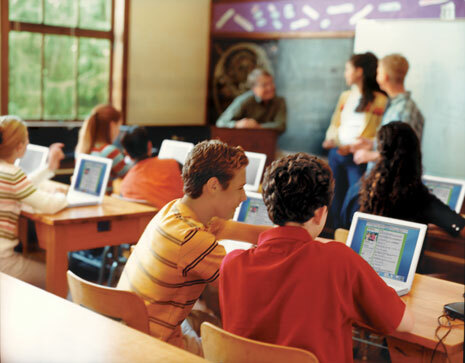 Last summer, Florida announced its goal to phase out textbooks in favor of digital learning by the year 2015. And Alabama representatives are planning to introduce the "Alabama Ahead Act" which would allow schools to purchase electronic tablets instead of textbooks. The state has already made large investments in statewide broadband service. Is digital learning an area where American ingenuity and innovation can be bolstered by public policy? Can it mean equal access to cutting-edge, excellent education is attainable? In order to realize this vision our systems need to be aligned. In a recently released study, only one out of five teachers believe they have the know-how to teach effectively with technology, despite a 91% rate of digital access. Schools of education must model this type of teaching and learning for a new generation of teachers. Funding shouldn't necessarily be equitable, but rather that it should lead to equitable outcomes. We need to move beyond pilots and focus on ensuring every student has access to best practices. Innovations must be matched with supportive policies, not to mention supportive teachers and parents. One thing we know from OECD studies is that excellence in education cannot happen without equity. Let's not let the promise of e-learning go by the wayside when there are successful models that show us the right way. The ICT Mark is an accreditation for schools that have reached nationally agreed levels within the self-review framework. Schools accredited with the ICT Mark standard are demonstrating that they are committed to using technology to improve their overall effectiveness and efficiency. The continued development of the ICT Mark by NAACE, supported by the Department for Education is supporting schools to raise standards by using the Self-review Framework. Celebrate putting technology at the heart of elearning in your school by working towards the ICT Mark. The International Technology in Education Mark (ITEM) is an Internationally recognised accreditation based on the ICT Mark and ISTE NETS. Accredited by NAACE, which is a UK based ISTE affiliate, ITEM provides the framework for International schools to self-review their technology provision throughout all areas of the school from administration and management to curriculum technology integration. The ICT Mark/ITEM can help your school to demonstrate the effective use of technology throughout a range of initiatives and as ICT reaches deeply into the core of all school activities the ICT Mark/ITEM can provide widespread benefits across many aspects of school life. * Includes promotional material and guidance on how to use the ICT Mark to promote your school. As you can see the working towards the ICT Mark/ITEM can benefit your school in many ways. My next post will look at The Self Review Framework for the ICT Mark/ITEM. Five hospitals are the first in the nation to receive The Joint Commission's advanced certification for palliative care, a six-month-old program that the agency's David Eickemeyer says "has taken off faster than any other advanced certification program we've ever introduced, including stroke." The Joint Commission does not have a "regular" palliative care certification. It chose to call this "advanced" certification to distinguish these programs from hospitals that simply say they have palliative care programs. Provide a full range of palliative care services to hospitalized patients 24 hours a day, 7 days a week, with team members available to answer phone calls nights and weekends, and be able to see patients in the hospital whenever necessary to meet patient and family needs. Have already served at least 10 patients and had one active patient in palliative care when it received its on-site review from the Joint Commission. Have the ability to direct clinical management of patients and coordinate care, such as write orders, direct or coordinate activities of the patient care team, and influence composition of the patient care team. Use performance measurements and have at least four months of measurement data at the time of the first on-site review. Have a licensed interdisciplinary program team consisting of a licensed independent practitioner, registered nurse, chaplain and social worker. Depending on the needs of the population served, they utilize expertise of individuals from child life services, clinical pharmacy, gerontology, nutrition, pediatrics, psychology and rehabilitative services. Palliative care as a field of expertise is frequently misunderstood and misdefined by providers as well as patients. It is not only for the terminally ill, although many patients who receive palliative care may eventually go on to need hospice care services, Eickemeyer says. Rather, palliative care brings in experts to coordinate care for patients with multiple diagnoses to relieve their pain, suffering, anxiety, nausea, depression or stress, help them navigate the complex healthcare system and coordinate their care teams, regardless of how much longer they have to live. Professionals help family members and patients to prioritize needs and to assure that patients get the right care at the right time. In many cases, such programs have allowed the patient to be discharged sooner than he or she otherwise would. Only about 5% of hospitalized patients would qualify for palliative care services in most facilities. One study of patients with lung cancer found that palliative care programs actually helped them live longer. Eickemeyer, associate director for The Joint Commission's certification program, says that for some hospitals, making allowances for such a program may seem too far a leap. "Internal financing can be an obstacle," because there is no billing code for palliative care at present. "How much is the leadership willing to support this when it's not a money making idea for the hospital." He gives this example of the type of patient who would benefit with palliative care in a hospital with advanced certification. "A patient with multiple co-morbidities is admitted on a Friday, but on Saturday, the family comes for a visit. "After visiting hours, the floor nurse finds the patient in obvious emotional distress (for no apparent reason). An advanced palliative care team would know what to do, would ask the right questions: Is this patient in need of pain medication or upset because of something that came up with the family. The advanced program can assess the person any time of day or night to get the right resources." Sean Morrison, MD, director of the National Palliative Care Research Center and a director of the Hertzberg Palliative Care Institute at the now certified Mt. Sinai, said that over the past 11 years, "we've seen a dramatic increase in the number of hospitals that say they have palliative care teams," from almost none to 63% of all hospitals and 80% of hospitals with 300 beds or larger. "But until the Joint Commission's advanced certification program, there were no quality metrics or quality standards that were uniform across the board that would allow patients and their families to say, 'Aha, this hospital has a high quality palliative care team.' "
Even though many hospitals say they have palliative care programs, what they have often falls far short because resources and expertise are either not available or not available all the time, he says. Palliative care programs that meet tough standards have been hard to develop for three reasons, Morrison says. First: "There's still a misperception by hospitals (leaders) that palliative care is about end of life care, and that like the public, they need to understand and we need to better educate that there's a better way to take care of people with serious illness." Second: "It's not a revenue-generating program." Under fee for service payment models, if there is not an operation or procedure, "it doesn't fit well within the hospital's model." That will probably change as accountable care organizations and other payment models emerge under the Affordable Care Act. Third: There aren't enough people trained in palliative care or board certified in geriatric medicine. "It's a new specialty and there are simply not enough trained (palliative) physicians and nurses right now to fill the need. We really need some specific federal policies to promote the workforce issue." Morrison says that although he is pleased that the Joint Commission(JCAHO Compliance) has offered this certification and is pleased that his hospital was one of the first five selected, he doesn't think it should be voluntary but, instead, it should be "a key component of hospital accreditation," a necessary ingredient for federal reimbursement. "You can't call yourself a hospital in the United States without an intensive care unit ...or unless you have an emergency department. I don't think you should be able to call yourself a hospital in this country unless you have a palliative care team." Eickemeyer says that may come in time, but that this is a first step. Also, he says, some years down the line advanced certification may also mean hospitals will be expected to measure and improve on certain quality metrics associated with palliative care. Most of all, by calling attention to the need for palliative care services with an certification program, Eickemeyer says The Joint Commission "hopes to attract resources and attention that might not otherwise materialize" for this area of healthcare. About 20 other hospitals are moving through the application process and, within a year or two, he expects as many as 40 or 50 hospitals will earn advanced certification in palliative care.